Harry Verhaar has over 20 years of experience in the lighting industry, and is Head of Global Public & Government Affairs for Signify. He is responsible for the strategy, outreach and stakeholder management on energy & climate change, resource efficiency and sustainable development, with a key focus on the role of the LED lighting revolution. He has since the end of 2003 been the architect of the lighting strategy on energy and climate change, which has resulted in a global momentum on phasing out of old lighting technologies. Harry is a recipient of the 2011 UN Leader of Change Award, and has received the Carbon War Room’s Gigaton award on behalf of Philips at COP17 in Durban. In May 2015 he received the Energy Efficiency Visionary Award from the Alliance to Save Energy in Washington DC. He holds a MSc in Solid State Luminescence from the University of Utrecht, The Netherlands. Just last week we had an exciting launch of a thought leadership report we developed with the Rocky Mountain Institute. The “Energy Efficiency and Electric Vehicles” report covers scenarios and recommendations on how accelerated renovation of buildings can pave the way for the electric vehicles revolution, while keeping the world below 2 degrees Celsius of global warming. The report was launched at the UN Earth Innovation Summit on September 5 in Tallinn, Estonia. Estonia currently chairs the UN Environmental Assembly, who will be meeting for UNEA-4 in Nairobi in March. The recommendations from this report will be one of the subjects on the table. You may wonder why a report on buildings and transport as these seem two different unrelated subjects. How are these related in energy and climate scenarios, and what can one recommend that links these areas together? First, we see that although the climate rhetoric may differ at federal level in various countries on this planet, the situation is that almost everywhere the projected CO2 emissions reductions from commitments and initiatives is only roughly half of what is needed to keep global warming below 2C. From IPCC and IEA analyses we know that energy efficiency has to do between half and two thirds of the job of keeping us below that level. Here the two big areas that require more ambition and action are buildings and transport. 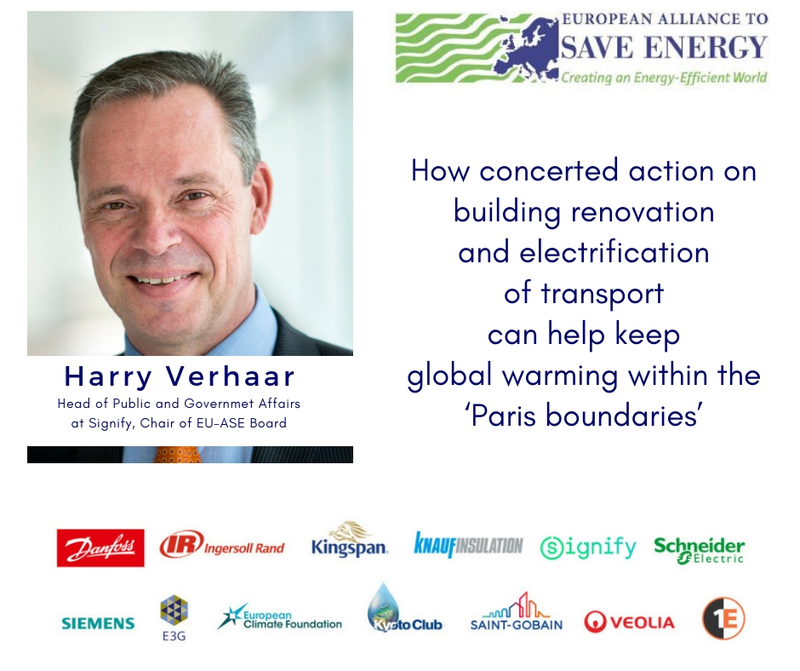 And the elegant relationship between the two is that by increasing building renovation rates we can ‘free up’ the energy that is needed to accelerate the electrification of transport! The EV-revolution offers tremendous climate benefits (as well as more comfortable driving) though demands that policy makers manage the resulting increase in electricity demand. The accelerated deployment of energy efficient technologies in buildings (where most of our electricity is consumed) is by far the most cost-effective way to accomplish this. The ambitious deployment of Electric Vehicles (EVs) with 90% of car sales being electric by 2040 requires an additional 3000 TWh of electricity, which is more than the whole of Europe consumes per year today. Increasing building renovation rates from the current 1% to between 3 and 5% per year (with the 5% rate estimated at current practice of 30% efficiency improvement, and the 3% renovation rate requiring larger improvements) will prevent the need to build and invest in new power generation. Furthermore, another important practical relationship between buildings and EVs is that the EV charging points can be included in the building (residential, commercial or public sector building) as part of the renovation. After all we will charge our cars while we are at work or at home. A third linkage between buildings and EVs is that most if not all new efficient technologies – like LED lighting – are digital, and thus our buildings can become smart buildings connected to the Internet of Things following these renovations. This will enable smart charging and load management that can further reduce power demand on the grid! All in all renovation makes our buildings fit for the 21st century as was also highlighted in a recent study by the Corporate Leadership Group. So, what should be done to make this happen? The report has several recommendations of which the most important is that policy makers should develop integrated policy frameworks, particularly on buildings and transport, while combining these with renewable energy policies making the energy we consume clean and sustainable. An important enabler for the increase in building renovation is that when the moment of building ownership or tenancy change would be used for deep building renovation – either for our homes, commercial or public buildings – this would do the job. And come to think of it, the additional budget required can easily be included in the mortgage or in the real estate portfolio, as these buildings will be cheaper to use and are safer investments for individuals and investors. Recent insights even show that an energy efficient building does not even require higher investments. It is critical that we get the charging infrastructure right, so that charging can be done where we live or work, and that demand response management balances the load on the electricity grid. So, we see through these scenarios and recommendations that the task at hand is pretty big. Yet, I believe that when we embrace these goals and work together to accomplish what is needed, we can get this done. It is not the first time to see massive change in a short period. The transition to LED lighting is possibly the fastest of the past decades. Only a little over 10 years ago two thirds of our sales volume were incandescent light bulbs, while today 70% of our sales is LED, and by 2020 every LED we put on the market will be a connected or connectable LED, thus fully converting to an IoT portfolio. For the planet our long-term goal should be to move to a net zero carbon world by 2050. This is why as Signify we announced that we joined the WorldGBC’s Net Zero Carbon Buildings (NZCB) by 2030 commitment as well as the EV100 program of The Climate Group. As a company our buildings will become net zero carbon and our company fleet 100% electric by 2030. My thinking is that if we can do this in this timeframe, we should be able to jointly do this across all sectors and geographies by 2050!